67-year-old Francis Davou, who retired from the Nigerian Air Force in 2008, and wife, Margaret, 63, a native of Zawan in Jos South Local Government Area of Plateau State and a retiree from the Nigerian Television Authority (NTA), are among the happiest couples in the world after Margaret was delivered of their first child. The baby girl came through Caesarean Section at the Gynaeville Specialist Hospital, now ALPS Hospital, 38 years after they had been married. “This is not my first attempt to have a child. I have undergone many surgeries and have done the treatment in different hospitals outside Plateau State. This is the fourth time; three times in other hospitals”, the new mother told Sunday Vanguard last week. The girl, named Bes and Hannah, is eight months old. Bes is a Berom word for miracle. Despite their age, the Davous never gave up on their dream to have a child. So when a relative, a nurse, told them about a fertility centre in Jos, the couple prayed and took their chance. “We put our money together. We are both retired, so we didn’t have much money but the doctors helped us. We went to the hospital and they gave me some treatment, and thank God it worked,” Margaret said. When asked if she ever attempted to go spiritual in the past to redress her childlessness, her denial was firm. “My husband is a pastor; we have always depended on God. Some people have been saying I went to one place in Lagos to conceive but I don’t mind because I know I only depend on God and they will hear the testimony,” she told Sunday Vanguard two days before she was delivered of the baby. Francis, on his part, now a pastor, spoke on his experience during their 38 years of childlessness. “My experience was bitter, it was a bitter experience”, he said. “I am, however, very happy and grateful to God because it is only God who knows how it happened”. Asked how he coped as it is sometimes difficult for a man to endure a childless woman, the obviously elated new father replied, “Christianity”. Francis explained that there will always be pressure on the man in his shoes from the family, saying, “My encouragement was from my own mother. She did not encourage me to marry another woman, she encouraged me to stay because she herself is a mother and she trusted in the power of God and that a child will come when it is time by the grace of God”. Dr. Kenneth Egwuda, the consultant gynaecologist at ALPS Hospital where the Davou woman was delivered of her baby, also spoke to Sunday Vanguard on how Margaret conceived by IVF and how assisted reproductive technology and gynaecology endoscopy is helping childless women to have children. Describing the 63-year-old mother as the oldest woman to have conceived through IVF in Africa, Egwuda said she came to the hospital in 2016, 38 years after she had been married and there had been no pregnancy notwithstanding three IVF treatments. “We admitted her and I felt she was in good state of health to undergo IVF treatment. We just did what we have been trained to do professionally, and the only attempt she had with us she got pregnant with the help of God because I don’t think anything different was done from what she had had in some other places”, the gynaecologist, 39, from Igbani local government area of Kogi State, said. “Initially it didn’t even occur to me that she was 63 years old. I just took her like every other woman until a colleague told me that ‘you don’t know you are sitting on the edge of history as you are dealing with the oldest woman to have become pregnant by IVF in Nigeria and Africa’, and that was when it became interesting to me. Before you knew it, her delivery time came and it was smooth. The delivery actually attracted the whole world to Jos because we had the Plateau State Commissioner for Health and some senior gynaecologists from the Jos University Teaching Hospital in attendance just to be part of the delivery. “Then the BBC came to see the woman. The Voice of America and other international news networks also came. Initially it was like it wasn’t going to be true and, after she was delivered, we thought she wasn’t going to be able to breastfeed the baby. But breastfeeding is taking place and the baby is eight months old and doing very fine. “Meanwhile, one important thing about her delivery is that it raised hope in women who have been trying to have children because, one week after, we began to see old women coming to ask whether there was also hope for them. “So the woman became an epitome of hope for those seeking the fruit of the womb and as many that are seeking have gotten while others are still in the process”. Going back memory lane, he said, “I am privileged to have been around the corridors of IVF as far back as 2006. This is my 12th year of being deeply involved in the practice. So I am among the oldest IVF practitioners in Nigeria as IVF in Nigeria started in 1998. I grew rapidly while in Abuja and became very versatile in the field of assisted reproductive technology. “I realized that I was too young to operate where I was. That is how I came to Jos to do my residency. And in my quest for excellence, I committed myself to grabbing anything that pertains to my profession. “So I went around the world studying. I was in the University of Warwick Centre for Human Reproduction. I was also in Munich for IVF training. I once did a presentation for my boss in London as a gynaecologist and he promised to sponsor my training in Minimal Access Surgery. So I got sponsorship for Minimal Access Surgery which is a kind of surgery where you don’t cut a patient open, rather a hole is made on the part to be operated and you put in all your gadgets and then operate using a computer and high-tech TV screen on the wall. I later proceeded to India where I trained in gynae laparoscopic surgery. I went back to London to train at the Royal College of Obstetricians and Gynaecologists (RCOG)”. Speaking on IVF success rate, he put it at between 45 and 50% at ALPS Hospital even though the world-wide rate is 32%. Describing lack of funds to do IVF by the people who need the service as one of the challenges in the practice, Egwuda said, “Power supply has also been a major challenge though we have alternatives such as inverter and standby generator. Here in Jos and across Nigeria, most of the things we use are not locally made. They are made in the United States and Europe and importing them is difficult because FOREX is a major problem”. On the award he received as ‘The best doctor on the Plateau’, among others, the gynaecologist said, “I may not be among the first people practicing IVF in Nigeria but I was the pioneer in Plateau State”. Sharing his perspective on the idea of a spinster doing IVF to raise a child or children, he stated, “You have gone into the controversial aspect. I am a Christian but my values are different. To have a child, there must be a mother and a father. Researches revealed that children raised by single parents develop certain abnormalities. Though there are many influential people in our society raised in dysfunctional homes, a person ready to stand as a father must agree and sign legal documents as the prospective father of the intended child. Doing IVF for a spinster is socially right as long as we are not breaching the norms of the society”. Egwuda admitted that IVF is quite expensive in Nigeria and not affordable for even those in the middle class. “The reason the price is high is because of Nigeria’s developmental stage. We are not a manufacturing country; we don’t make drugs and most of the consumables used for IVF are imported”, he said. “We would have wished that IVF is not as expensive but of course the exchange rate keeps going up. “But we are doing a lot to see that IVF is affordable. We have a lot of people now who are trained in the field of assisted reproduction technology thus making IVF cheaper. “Also, we are bringing on board a new modality which is a natural cycle IVF. In the natural cycle IVF, fewer drugs are used in such a way as to bring down the cost. “Many people can benefit from this, those who don’t have money can benefit from it, those who are still ovulating and are young can benefit from it, those who have diseases that cannot endure the medications of IVF can also benefit from it and, more importantly, because it is cheaper, it will increase the coverage for IVF and people of low economic status can do it”. 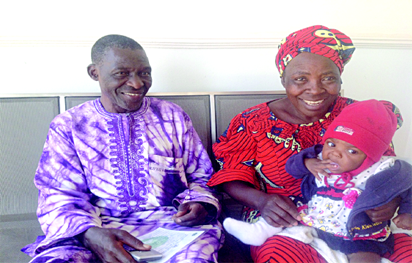 The post I never gave up on dream to have a child —63-year-old woman who gave birth after 38 years of marriage appeared first on Vanguard News.